Life today is fast paced and busy – if you’re reading this, you struggle to find time to cook for yourself. You probably buy at least one meal out each day, maybe 2 or 3. This is not only expensive, it’s a lot less healthy than preparing food for yourself. If you’re eating out daily or weekly, it means you really don’t know what’s going into your body, which is a huge barrier for improving your health. If you want to get healthier, you need to take charge of your diet, and that means preparing the majority of your food for yourself. In order to do that, you need to learn to prepare food – either quickly, or in large enough quantities to save yourself time, ideally both. Learning to cook large batch meals will save you time, allow you to consume better quality food, and make it easier to keep track of your intake over the course of your week. 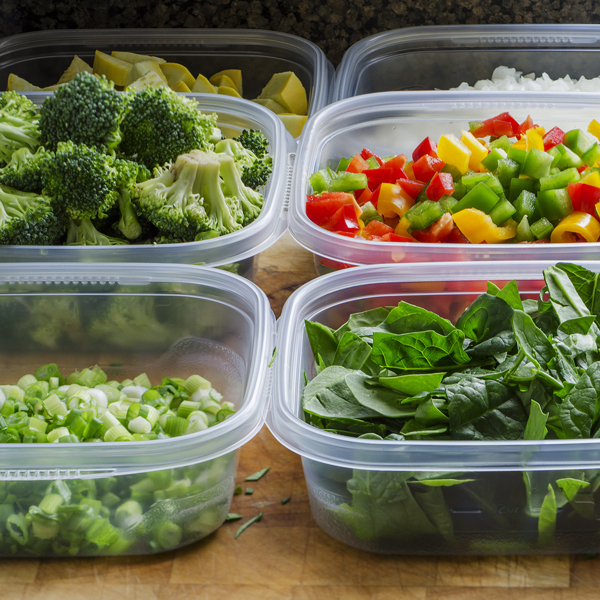 Step one: Prep your kitchen for your food prep. You don’t need to be in Emeril’s kitchen, but you do need to have some essential supplies. For preparing food with your oven, you’ll need to have at least one large pot and pan, and a baking pan. You should also have at least one sharp knife. A good way to test if a knife is sharp enough is whether you can slice a tomato without needing to use a sawing motion or start with the tip of the knife. If not, your knife needs to be sharpened. You can pay for professional knife sharpening for just a few dollars per knife, and this will make all food prep way easier. A sharp knife is a safe knife. You will, of course, need a cutting board for your food prep as well. A mixing bowl and wooden spoon should pretty much cover the remainder of your oven cooking needs. If you want to really get into making big batches of food, you’ll also want a blender and a slow-cooker. Lastly, you’ll need some bottles for your smoothies, and some tupperware for your other foods. Use glass, if possible, since it isn’t very healthy to microwave plastic. Or keep a plate at work so you can transfer your prepared meal onto that before using the microwave. Beyond kitchen tools, we’ll also need some basic food supplies. For stovetop cooking you should have some coconut oil. Check your spice rack, too. Beyond salt and pepper, you should have some seasoning blends – try a curry mix, Italian blend, any other spice mixes at the store will be good. If you want to get a little fancier, read this list of eight spices and how to use them for some good insight. You should also generally keep a supply of garlic and onions – these two foods can easily fit into almost everything you cook. Step two: Once your kitchen is properly outfitted, it’s time to start using it. The main tools we’ll be looking at are the blender, the slow cooker, and the stovetop. Recipes involving the blender should only take about 5-10 minutes, including cleanup, and can make 3-4 servings at a time. Slow cooker recipes will take about 30 minutes, plus a 6 hour wait or so, 5 minutes to clean up, and can easily make food for a week. On the stovetop, recipes can range from 10-60 minutes, and can easily be scaled from single meals to several days of prep. When working with the blender, you can easily sneak some extra vegetables into your diet and make large batches of food that will last for a few days. Additionally, it’s the absolute fastest way to make meals. Use protein powder as a base for your smoothies in order to ensure you are getting plenty of fuel for your muscles if you use smoothies as a meal substitute. 3 smoothies perfect for a post-workout snack. 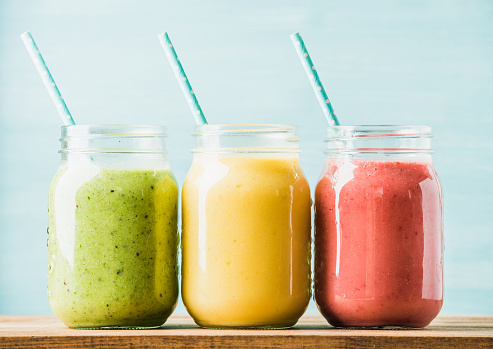 By swapping out just a few ingredients, you can make 3 unique smoothies that will taste great and serve as an awesome post-workout snack. Each of these smoothies, when divided into thirds, will provide about 250-300 calories, about 25-30 grams of protein, 30-35 grams of carbohydrates, and 3 grams of fat. They also have some great nutrient content for amazing health benefits – links are inserted on each of the ingredients. The foundation of the smoothies is 4 scoops of “SFH Pure” protein powder (sold at CSC’s front desk), 2 cups of frozen spinach, and 3 cups of unsweetened almond milk. You can use milk instead (use whole milk, the full fat variety is healthier than reduced or nonfat) which will be about 8 grams of protein, 8 grams of carbs, 8 grams of fat, and 120 calories more per smoothie than the almond milk. If you need a vegan protein powder, try “Garden of Life” or “Vega,” both sold at Whole Foods. For your coffee fix, use 3 frozen bananas and SFH Pure Coffee flavored powder. For chocolate lovers, use 3 cups of frozen strawberries and SFH Pure Chocolate flavored powder. For a tropical twist, use 3 cups of frozen peaches and SFH Pure Coconut flavored powder. You can also use the Vanilla flavor with any of these fruits quite easily. The spinach may seem a little off-putting, and it will give the smoothies a greenish tinge, but the flavor is neutral and the benefits are well worth it. Spinach is high in magnesium, which is a super important nutrient, good for boosting recovery and reducing muscle soreness. Slow cookers are the best for high volume cooking; you can prep your food at night, and in the morning you’ll have several days of food ready to go. Chili is one of the best meals you can make in a crock pot/slow cooker – this turkey chili recipe is packed with protein, and suggests some healthy fats to be added as toppings. Cook overnight in the slow cooker instead of on the stove top. This orange chicken recipe is another great one to cook overnight on low. Add a pound of chicken chopped into 1-inch chunks to this otherwise vegetarian broccoli and cheese soup and cook overnight for another roughly 8 serving turnout that will keep you coming back for more. 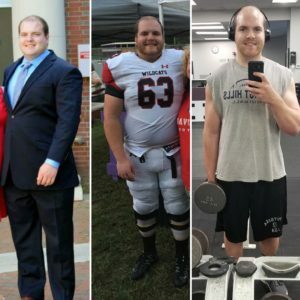 All of these recipes have a good dose of protein, and I also chose them because this site breaks down the nutrition information for you, so it’s an easy place to start tracking your meals. Using the stove shouldn’t be as challenging as it sometimes feels. Cooking with a large pot or baking, you can make some huge meals that will last you all week. Double this vegetarian paneer tikka masala recipe, which takes about 45 minutes and just a large pot and the oven, because it’s delicious and you’re going to want more. Serve this baked zucchini recipe with 1 cup of whole milk greek yogurt to get another big dose of vegetarian protein. Double this recipe for chicken and tomatoes that should only take about 30 minutes to make and it will last you all week! If you don’t want to follow someone else’s recipe, here are some basic guidelines for making big batch meals with the slow cooker or the oven. Start with 1-2 pounds of any kind of meat, or tofu for vegetarians. Chop up as many veggies – especially onions, garlic, celery, tomatoes, and leafy greens – as you can get your hands on, and heat them all together in a pot, slow cooker, or baking pan. This will consistently yield tasty meals that are high in protein, and should take only about 20-30 minutes of prep. If you use a pan, the volume must be lower but it should be cooked in about 30-40 minutes, 60 minutes or so in a pot, and with a slow cooker you can set it on low overnight and just turn it off and pack for lunch in the morning.